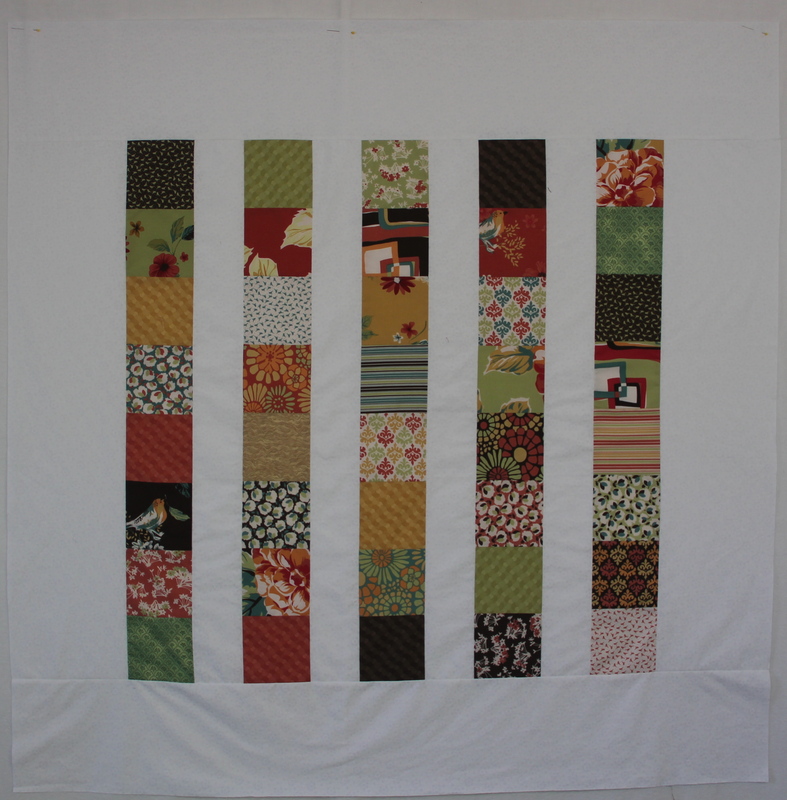 It’s been a while since I updated my Strap Strategies file, and I realized I’ve made a lot of new quilts since I set-up that tab. So here are some fresh pix to spark your interest and some links to my blog that describe some of the processes I go through when making these fun and easy quilts. As you can see there are a lot of styles and possibilities when you start sorting your straps! 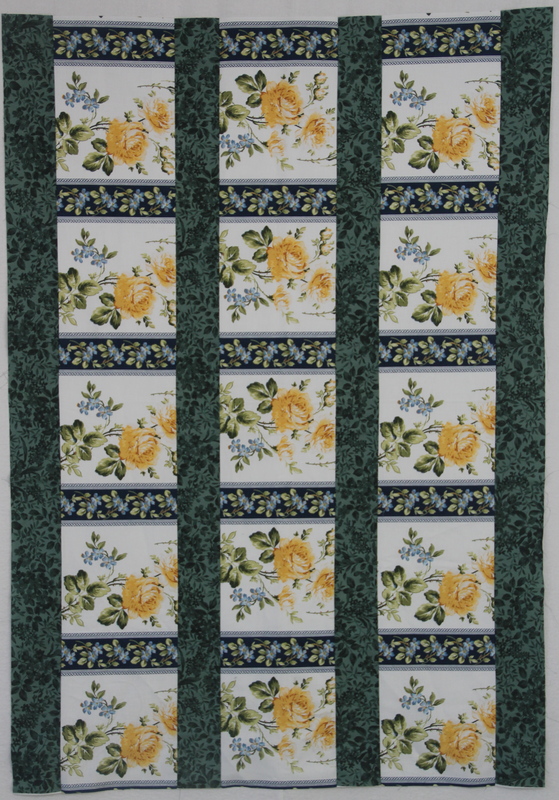 For more pix of samples check out the Scrap Stratigeis Class tab at the top of my home page. 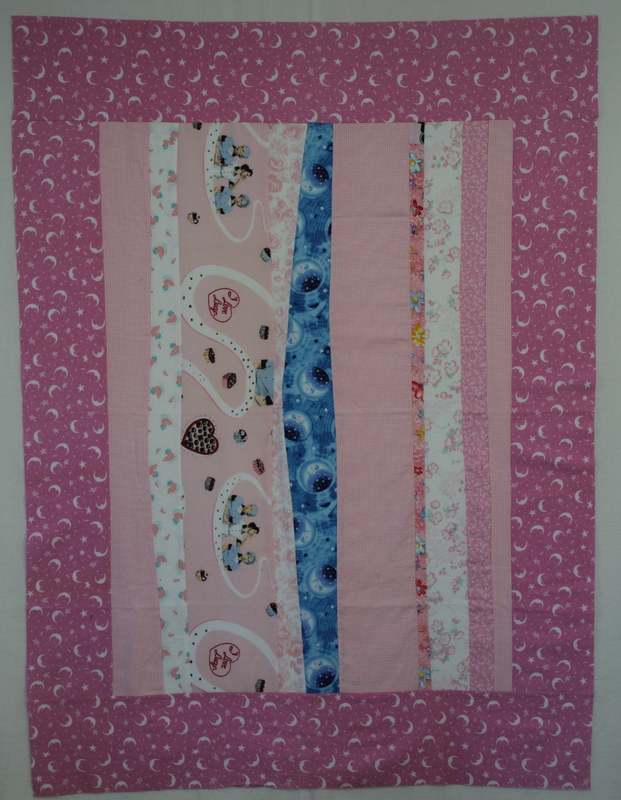 And for more info on my general quilt activities check out my blog at; cspoonquilt.blogspot.com Any specific questions you can email me at ; cspoonquilt@yahoo.com. I hope to see you in Class! Happy New Year!! Cheers, Claire W.
In this case the yellow house with the blue roof and dark sky reminded me of that song “I’m going back to my little grass shack…”, I guess the batiks help to give it a tropical feel?! Anyway, it got me to thinking, ‘what could I surround that little house with to create a tropical scene’? 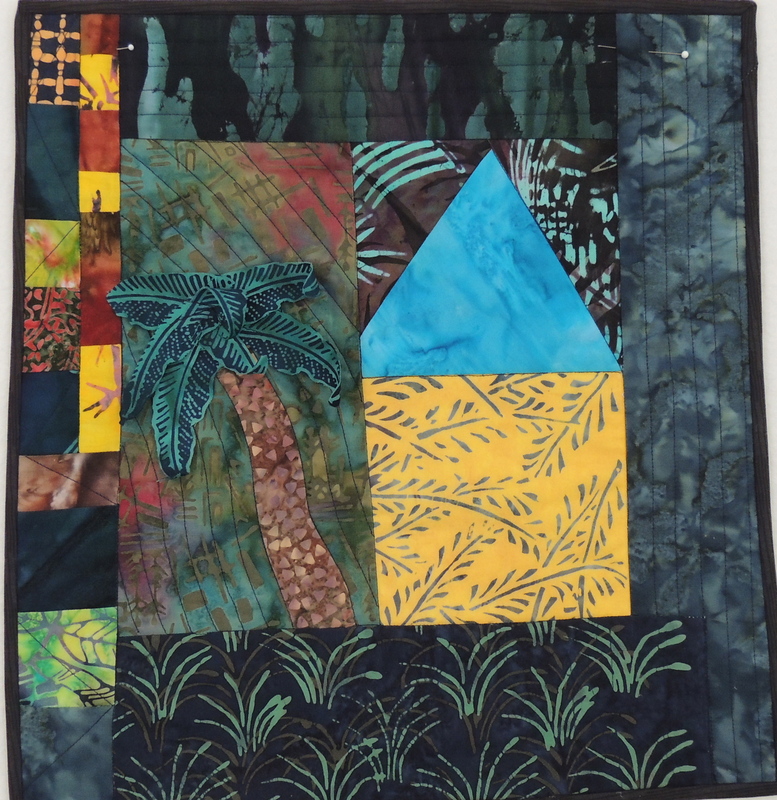 I remembered that I had some palm frond batik and dug that out of my batik stash and then found the grass and bark fab to make the palm tree and grass setting for my shack and with a few batiks for the borders to finish, there was my little tropical scene in no time. 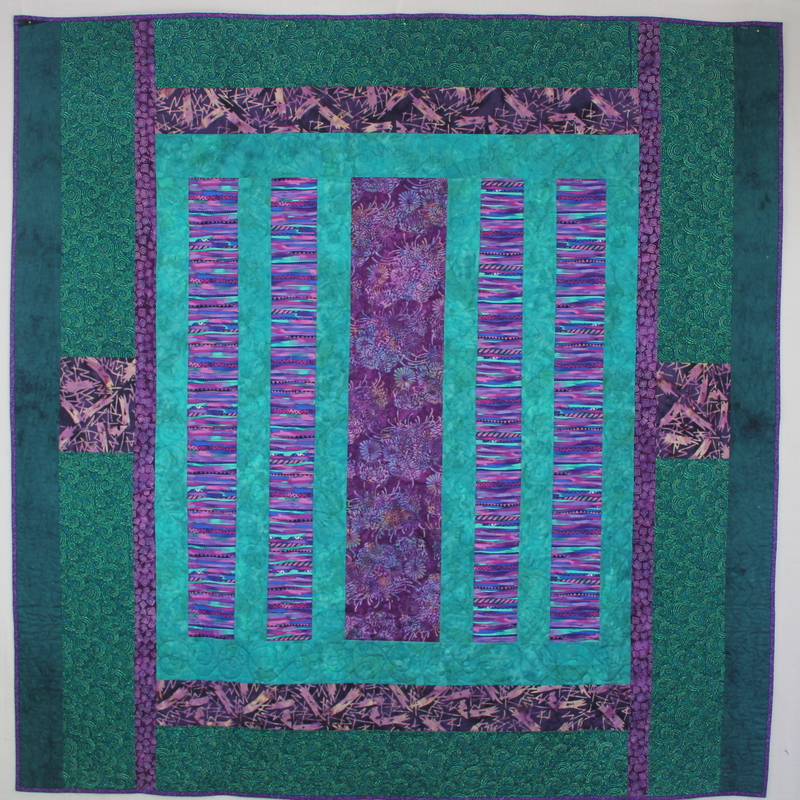 Wall hangings and “Art” quilts don’t have to be arduous projects? Just start with a fun idea, a little story that you want to tell. Find fabrics that help illustrate or reprsent that idea in someway and then put them together in an interesting way. That’s What my class “Let the Fabric do the Art Work’ is all about. 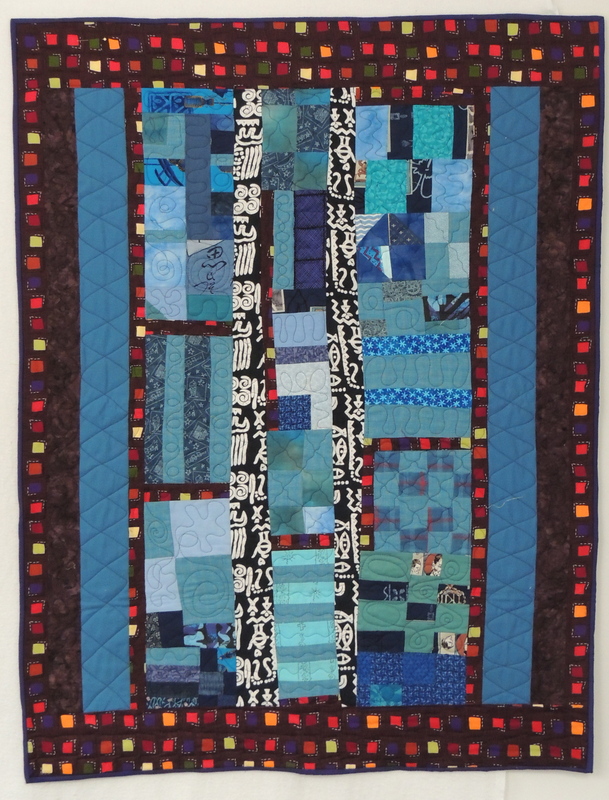 Check out the Art Quilt Class tab at the top of this page for more details. Welcome to my website! Included in the tabs above are a sampling of my classes, presentations and general information about me. I f you have any questions about my classes or programs please feel free to contact me by email = cspoonquilt@yahoo.com , or leave a comment below. 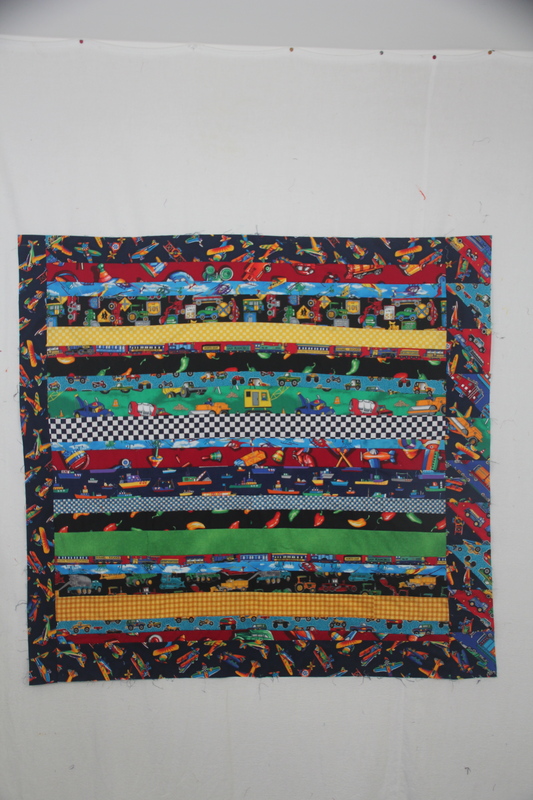 For a week to week look at my quilting activities visit my blog = cspoonquilt.blogspot.com. Thanks for stopping by! 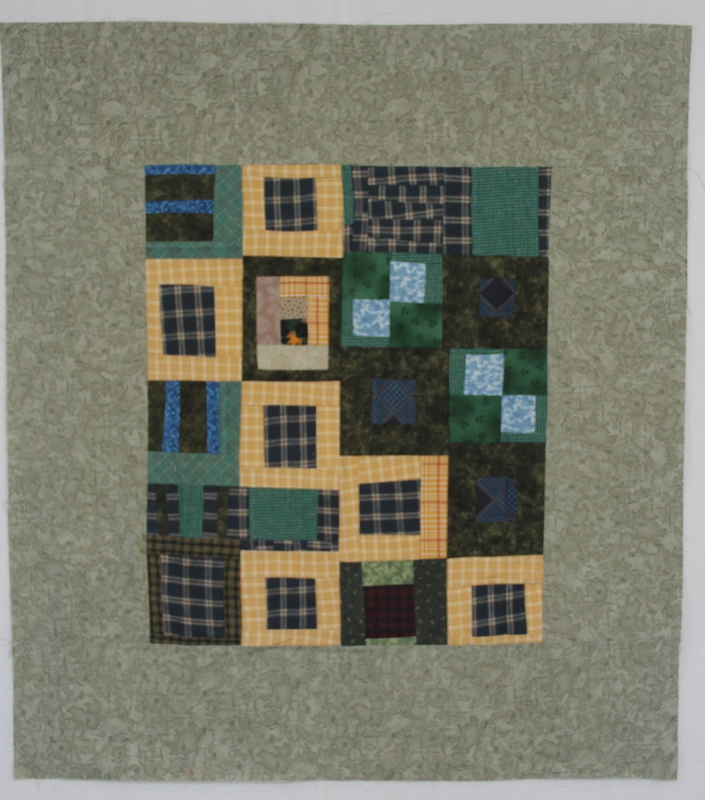 I started this project in one of the first quilting classes I ever took ! That would have been 1995 or early 1996. I know this because it was a class that Vicki Johnson taught for our local guild not to long after she had published her book “Paint and Patches” 1995, AQS publishers. I dug out the book to get a fix on the date. 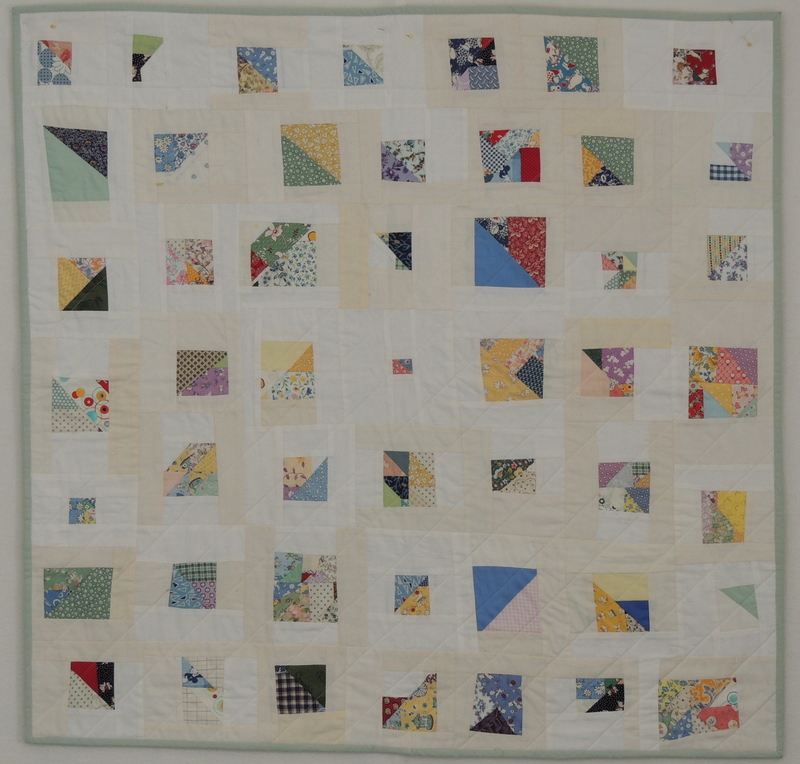 It reminded me again what a great Artist and Quilter she is. Vicki has a very unique style of mixing paint, fabric, thread work and patch work together to make beautiful wallhangings! What motivated the sudden interest to finish this project? 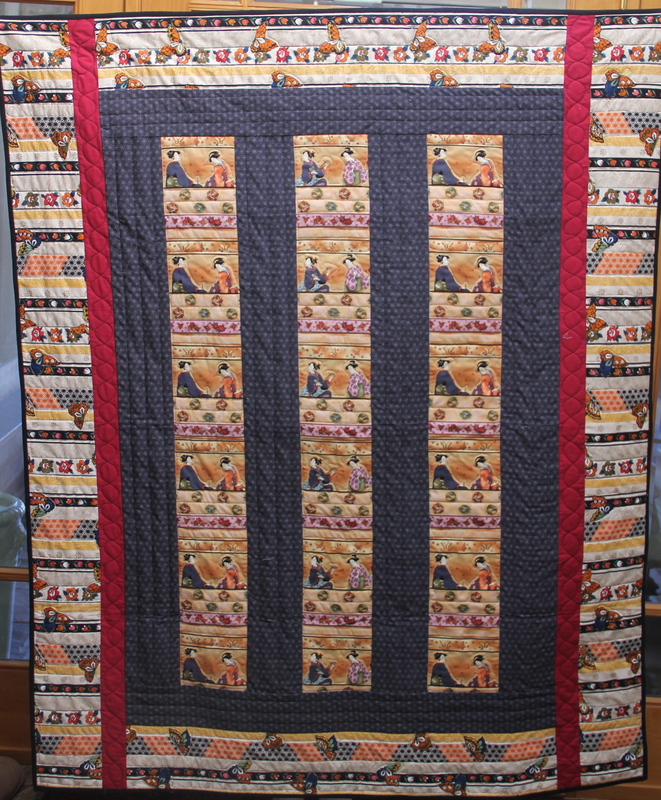 Our local guild’s Faire (PVQA.org) was at the end of February and the Quilt Challenge this year was to depict your favorite Sight or Tourist Atraction of the Monterey Bay Area. 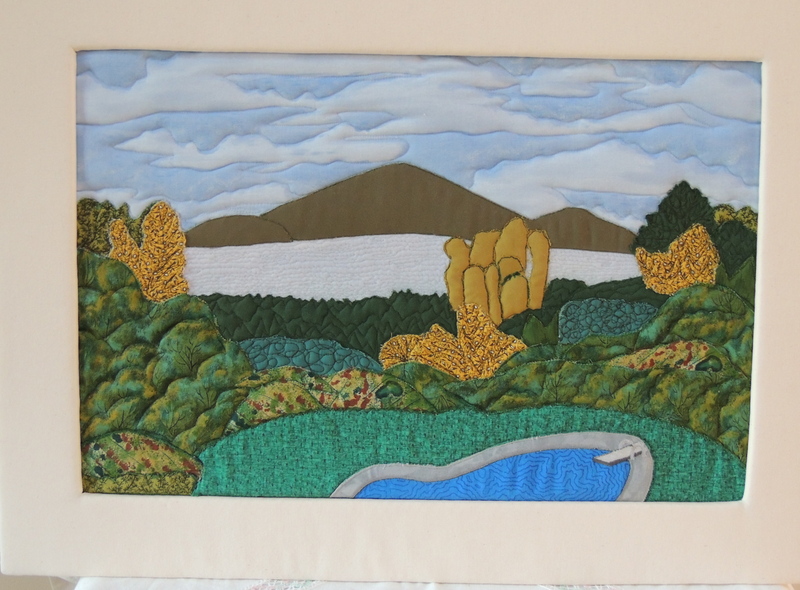 I immediately thought of this little landscape which I had started sooooo many years ago. I live in the Santa Cruz Mountains looking to the South across the Monterey Bay to the Monterey Peninsula. It is a glorious view that I am fortunate enough to enjoy everyday (not withstanding the fog) from my back porch! The morning of Vicki’s workshop I had nothing prepared. It was suggested to bring a picture of a landscape to work with. I had no picture so I just made a quick sketch from my back porch as a guide. Well, the class was great, Vicki is a very good teacher, I learned a lot including how to ‘soft edge applique’. A very handy technique I have used many many times since. By the end of the class I had cut out and glued most of the elements to the foundation, but once it was home I did not know what to do with it. I lay it in between some pages in a sketch book and there it sat essentially untouched since the class. 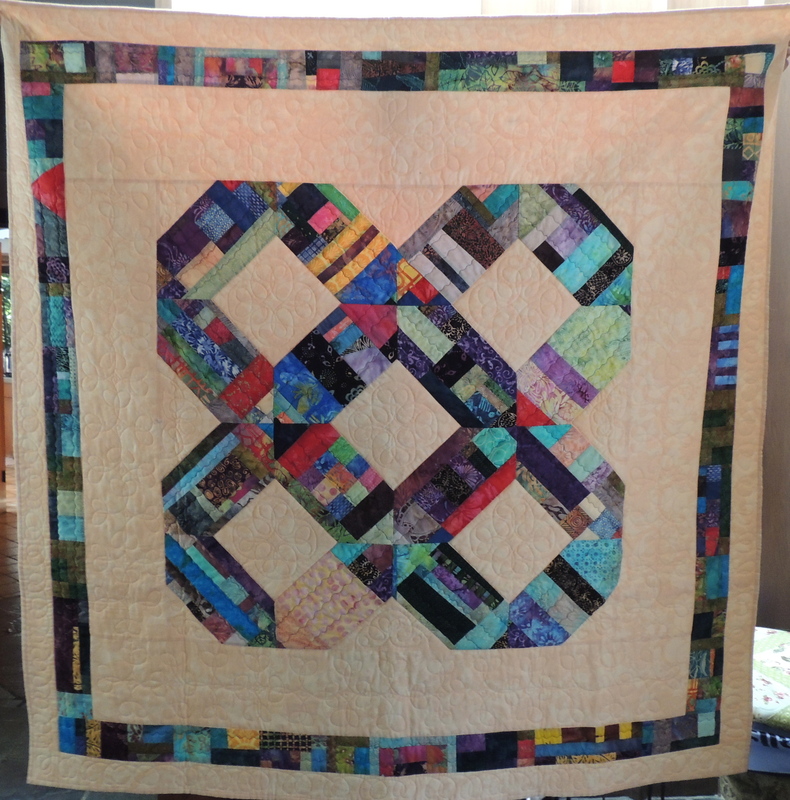 The Challenge was the motivator but I think the ability to finish the project came from the many years in between of learning and experimenting and building the skills I needed to finish the quilt the way I saw it in my head. Sometimes it just takes time and a long incubation…. cheers, Claire W.
That lead to a whole bunch more experimenting with medallion layouts. There are probably a few more lurking around that I have not taken pictures of but that’s just what I found in my photo file. As you can see it is a very versatile kind of layout that I plan on exploring more as time goes on. In fact I’ve put together a class that I think will be a lot of fun and beginner friendly too! See the tab in the header for description and materials list. Cheers, Claire W.
I really like Bar quilts. 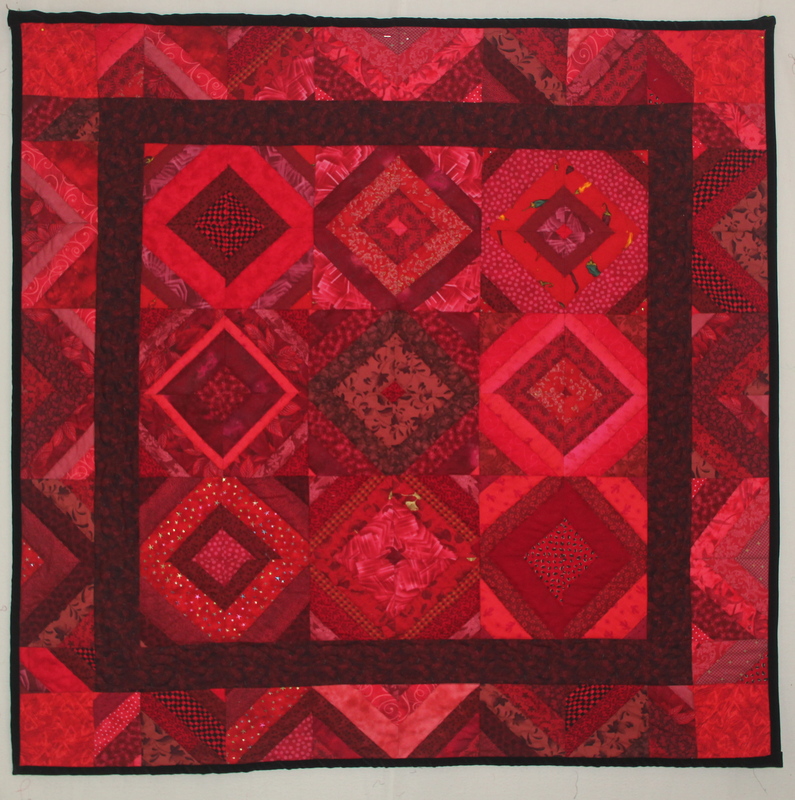 You can get alot of bang for your effort when constructing bar quilts if you choose your fabrics carefully. For example banded prints that run parallel with the selvage can be cut into wide strips cut selvage to selvage and sashed and it almost looks like vertical rows of blocks. 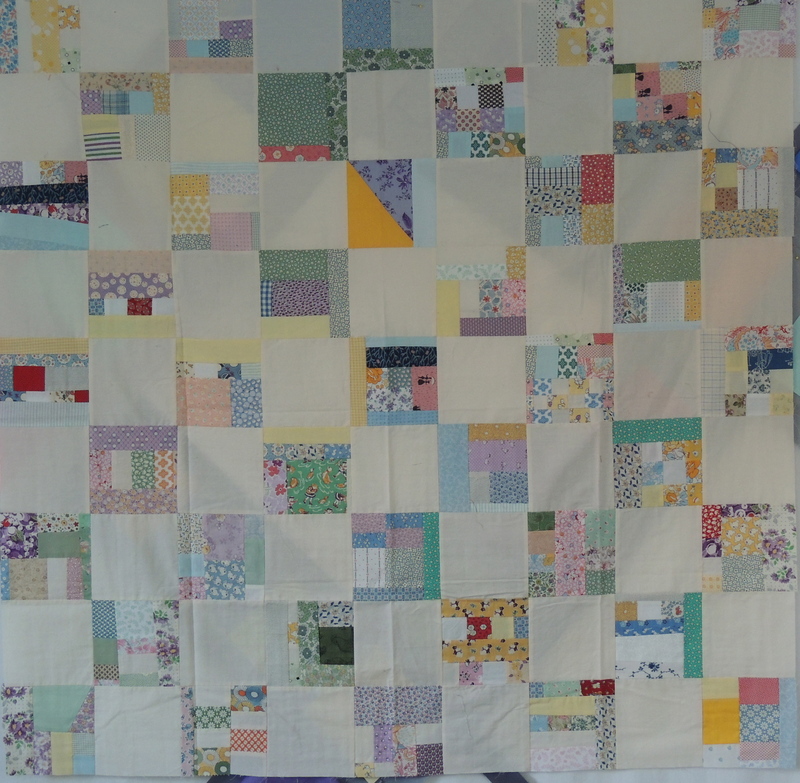 Floral Fabric Bars, 30″ x 43″, 2011. Panels can be arranged in a similar fashion. Another easy application is a packet of charm patches. 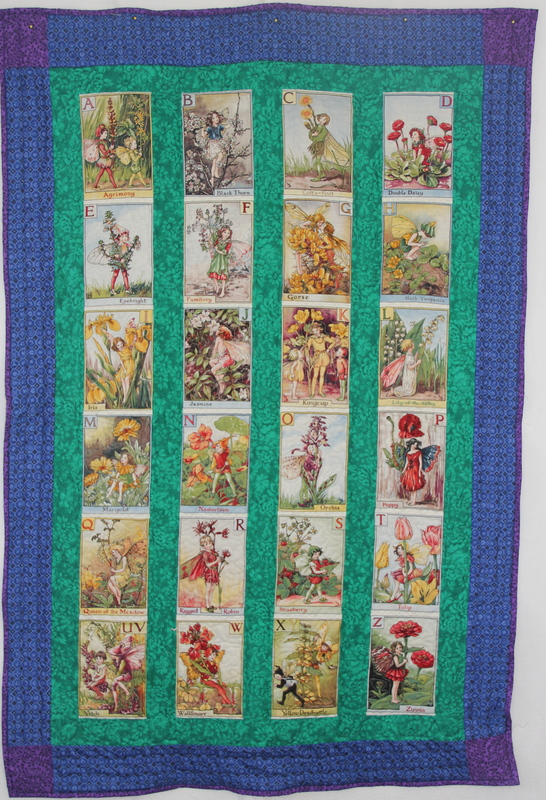 This was made with a packet of 40- 5″ charm squares and some sashing. All I had to do was cut the sashing and borders and sew. soooo easy! And really charming…sorry I couldn’t help myself. You might remember this one from an earlier post. 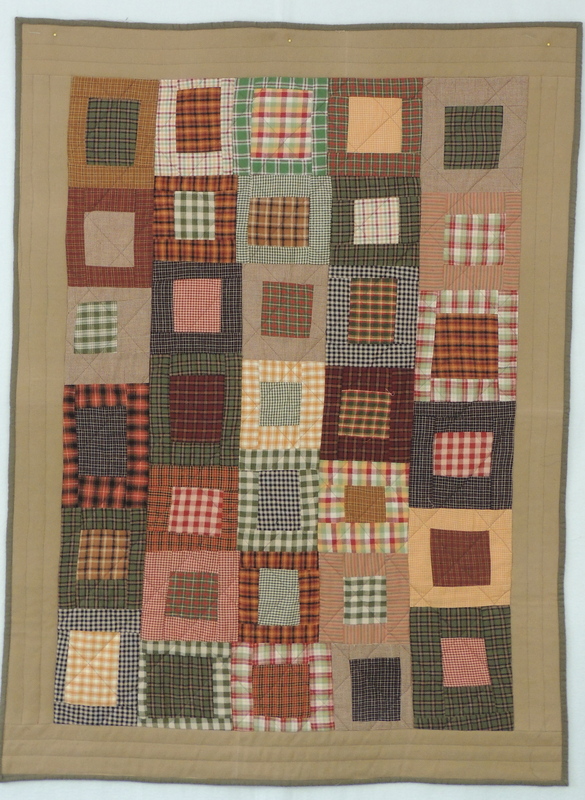 The squares in this quilt were simply leftover end cuts, that were all the same width. Sometimes just random strips in similar colors can make nice bar quilts. 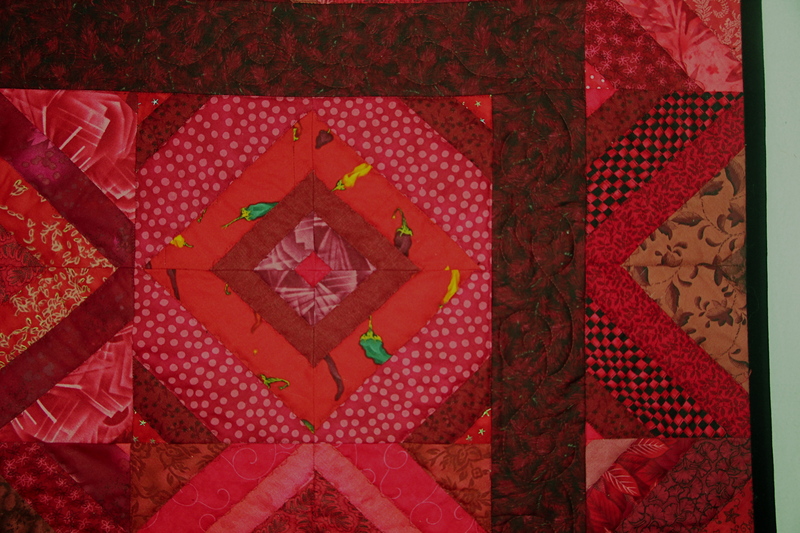 These are all stash quilts. 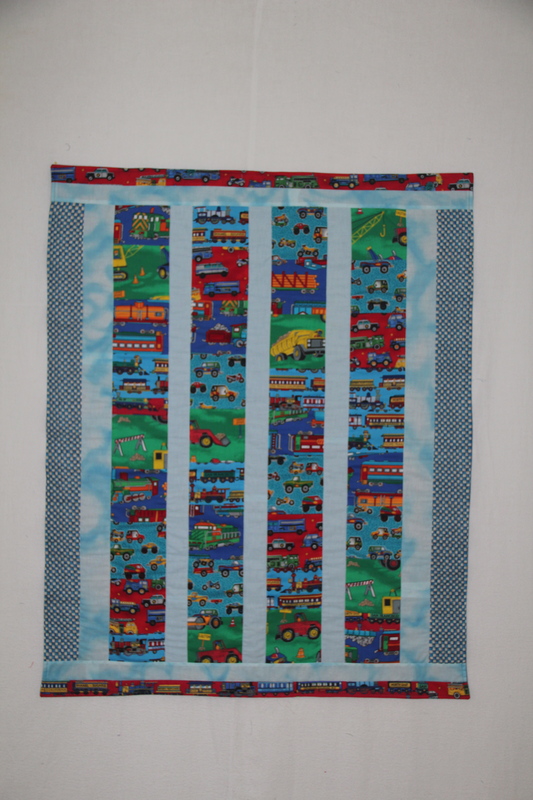 Simple to sew, fun to make, great looking and take very little time. 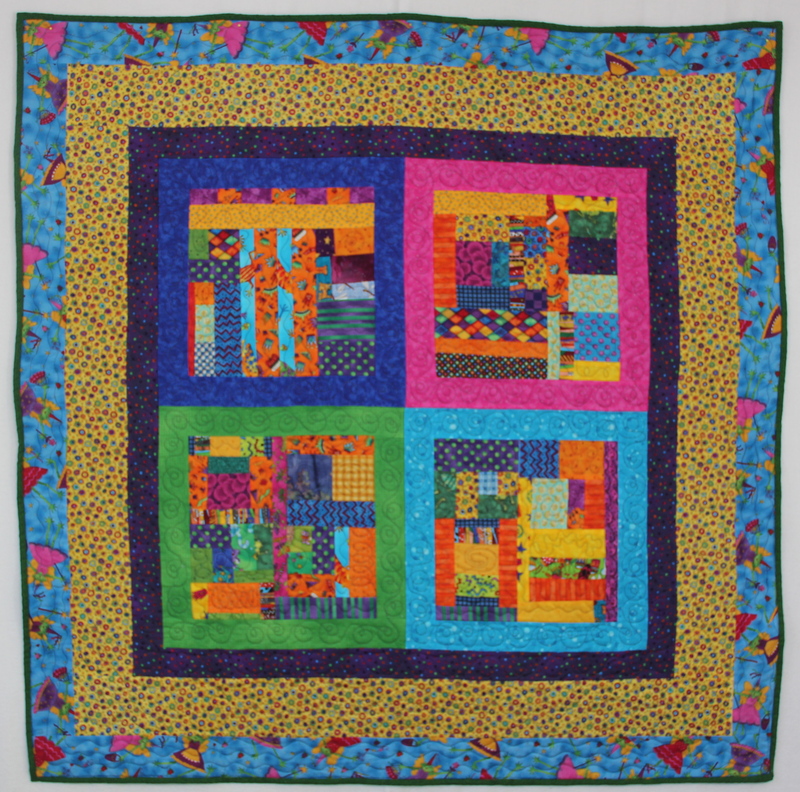 They are great projects for charitable quilts or give-aways ’cause they aren’t huge investments of time or resources. Well July is half over but happy July anyway. cheers, Claire W.
Big Red Ranch is Almost Finished! I’ve almost finished Red #2. I kept the quilting really simple, my Long arm version of “stitch in the ditch”, which is simply a small squigley line along the seams. 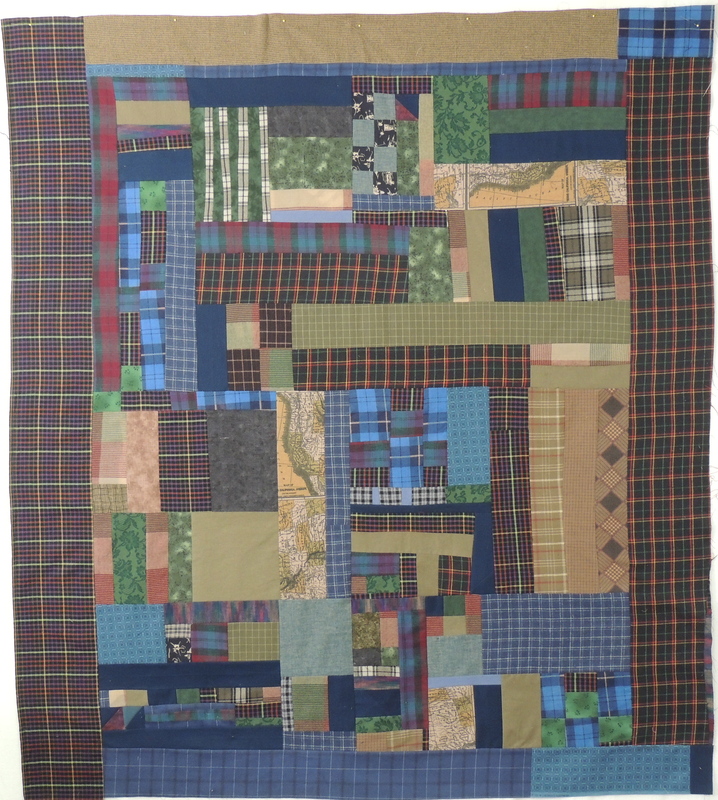 But since I was thinking I was going to give this to my mom as a lap quilt I backed it with flannel. That left me with the idea of using something soft for the binding. I had some black velvet in my stash. I thought that might be nice, black and red is always a good combo, right? Well the black and red looked rather well together but velvet as a binding is a bit tricky. 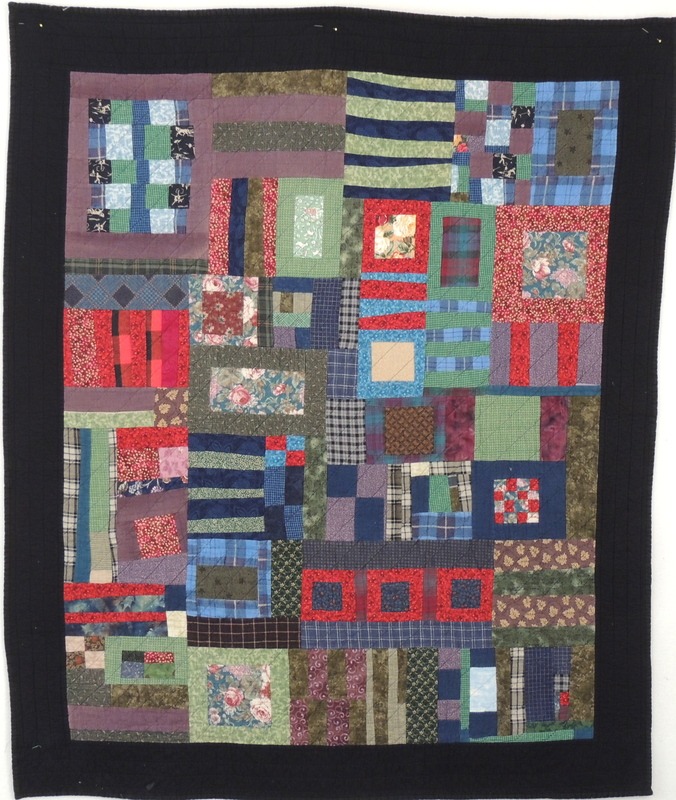 The quilt was nice and square but with the velvet binding the edges went all wavy gravy; even tho’ I used my walking foot. I guess there is just too much slip, slide and bulk in the velvet to be-have under a presser foot. You don’t see it in the picture ’cause I plastered it to the design wall.